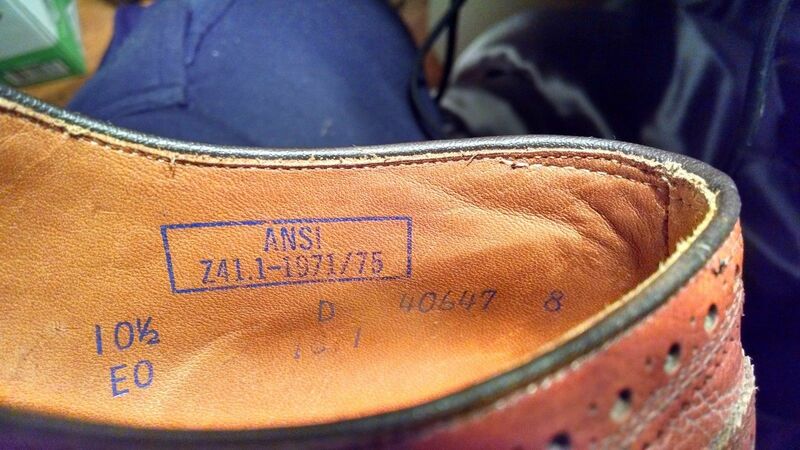 This post covers both vintage shoe sizing and the terms that are often found in vintage shoes. I added a number of photos to illustrate the sizing and terms. I am not going to cover shoe styles since there are plenty of other websites that go deep into the various shoes styles. This is a working list that I started last year. I will keep it up to date with additions or changes. If you have something to add or if I have a wrong definition for a term (it happens), please leave a comment to correct the information. 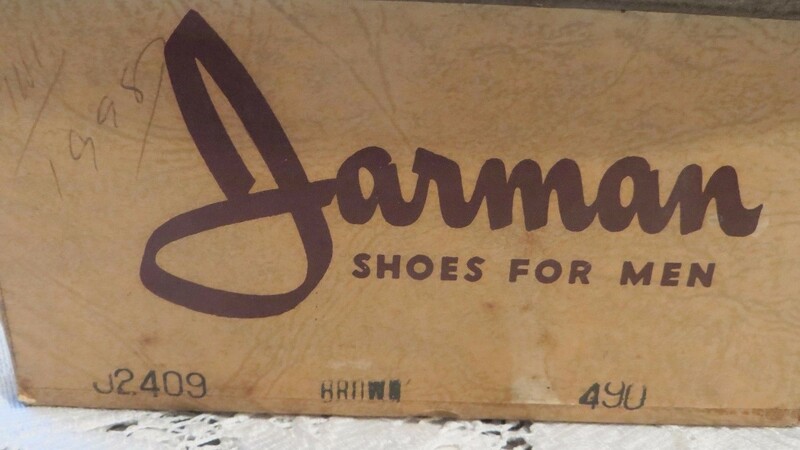 A frequent issue with pre-1960s shoes is that the pair will not have a standard US size listed on the box or inside the shoes (i.e. size 10.5 E). 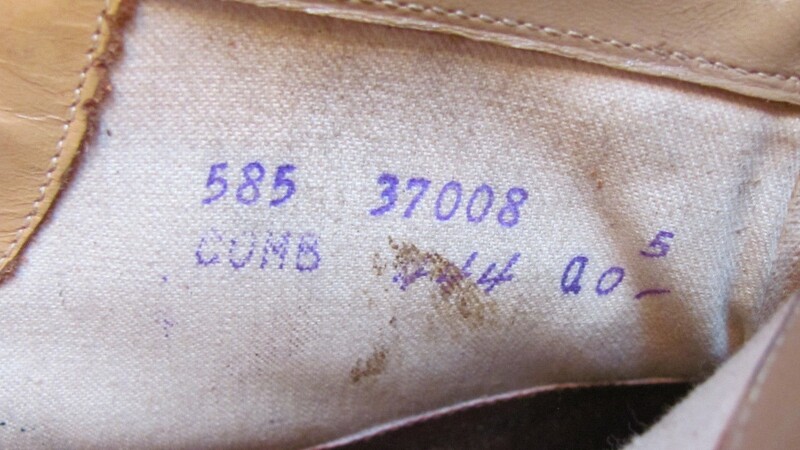 When this is the case, check the inside of the shoe for a group of numbers that is 3 or 4 characters long. 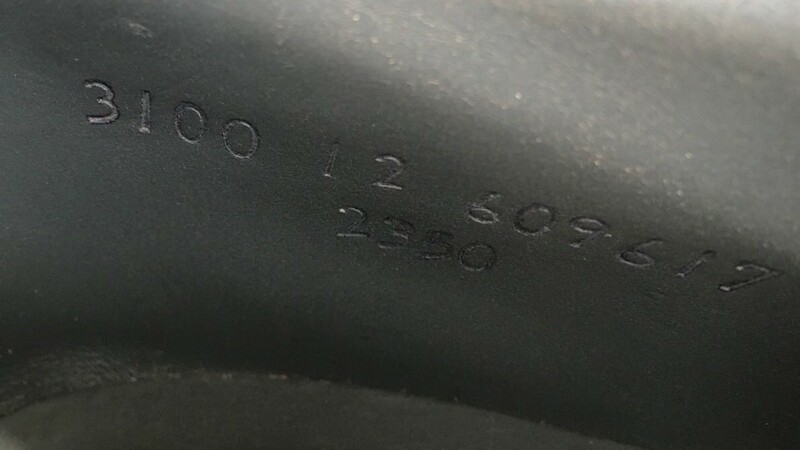 If found, this is likely the encoded shoe size. The first digit represents the width (A=1, B=2, etc), and the second set of digits are the length (105 is 10.5). For a 10.5 E pair, the encoded size would be “5105”. Below is a chart for converting the encoded size to standard US shoe size. 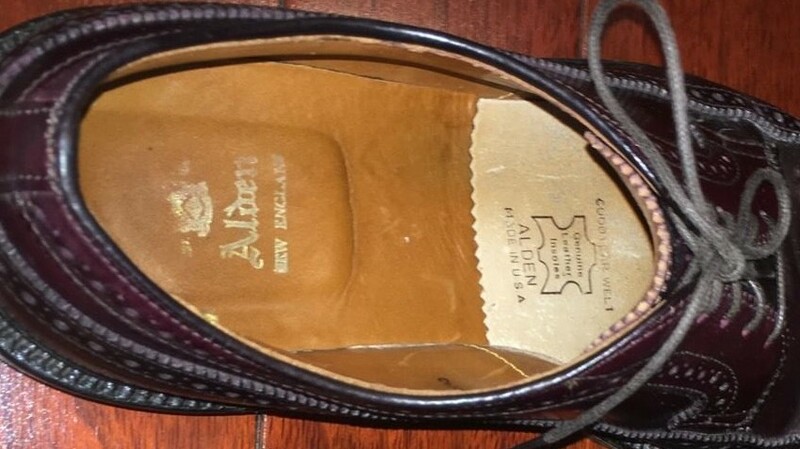 These are a few visual examples for identifying the encoded size for a vintage pair of shoes. When you still can’t find the size of the shoe, you can use the chart below to help find the shoe length. 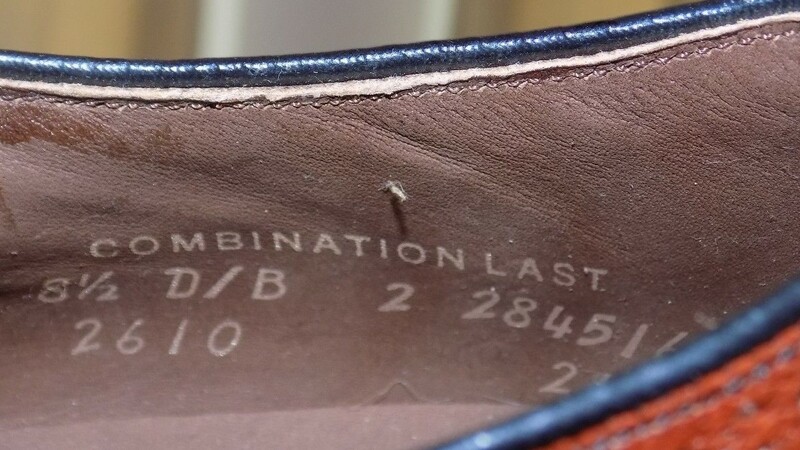 I have found measuring the insole, not the outsole, gives you the best representation of the shoe size. 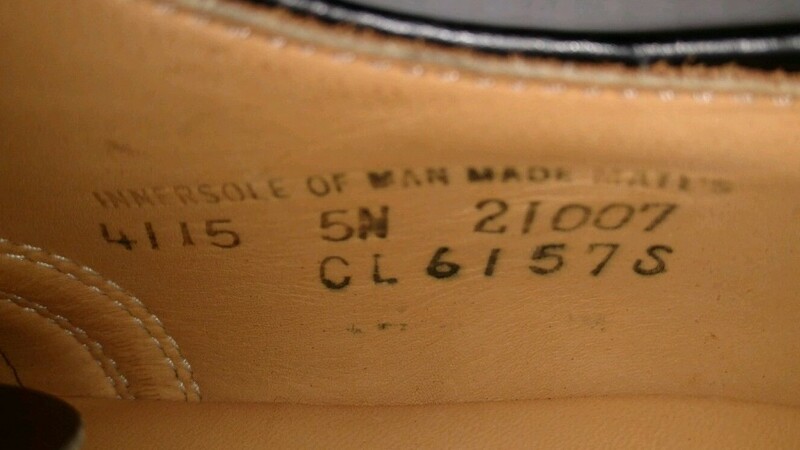 The measurements below are the length of the insole (what’s the insole? see below), and it should be taken with a measuring tape. I obtained these measurements from a orthotics manual. Below are a list of terms you might find on the inside or outside of the shoe. ANSI Z41 – American National Standards Institute approved footwear offering a protective toe (usually steel), and potentially having impact and compression protection. Combination Last – the shoe form has different widths for the ball and heel of the foot. You will see this as part of the shoe width (i.e “D/B”). The larger size is the width of the ball and the smaller is the width of the heel. 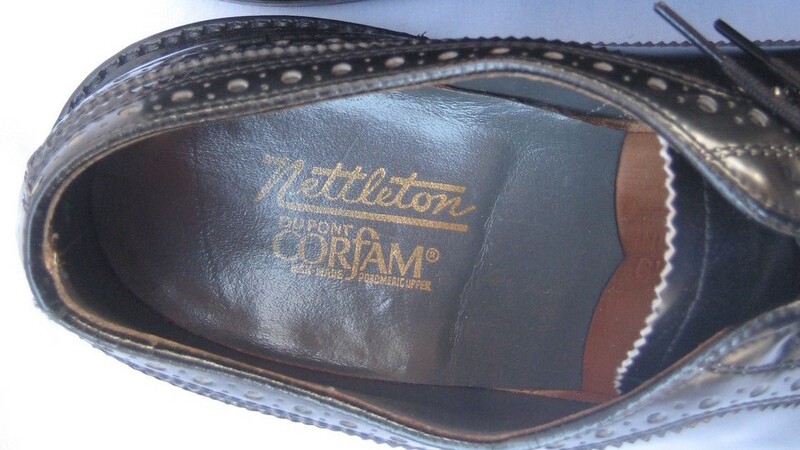 Corfam – Synthetic, breathable leather made by DuPont from 1964 to 1971. 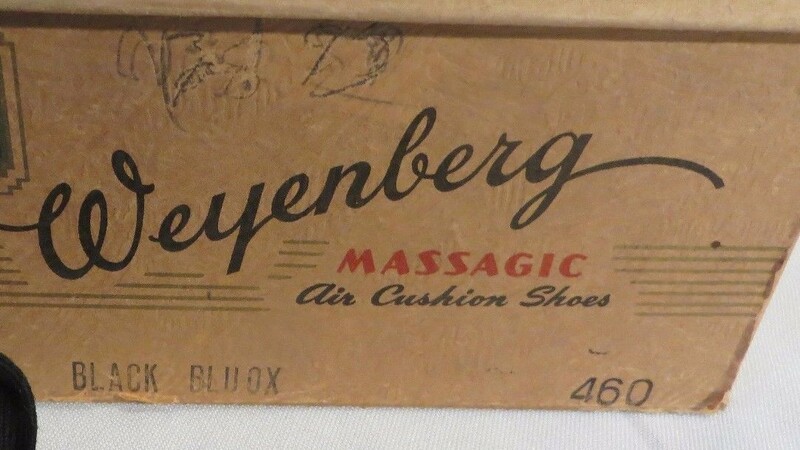 Continues to be used in shoes today. 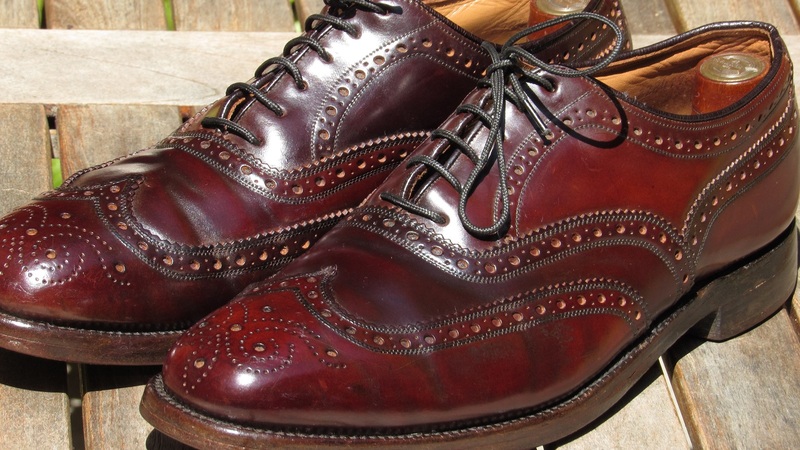 Looks somewhat like polished cobbler or shell cordovan. 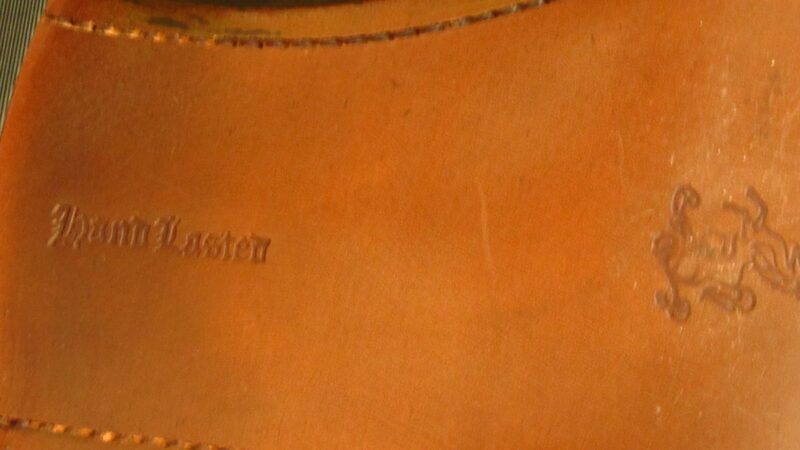 Insole – This is a layer of leather (usually), that covers the sole and is the foundation of the shoe. 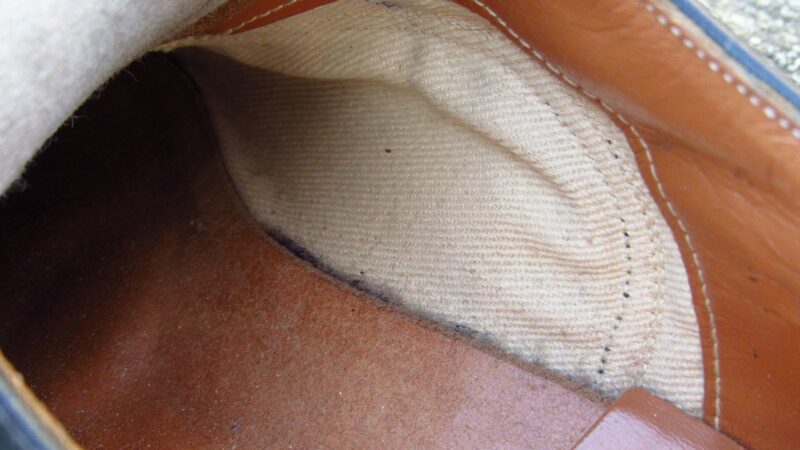 There is often another layer of material covering the insole partially (heel pad) or entirely. Sometimes referred as the innersole. 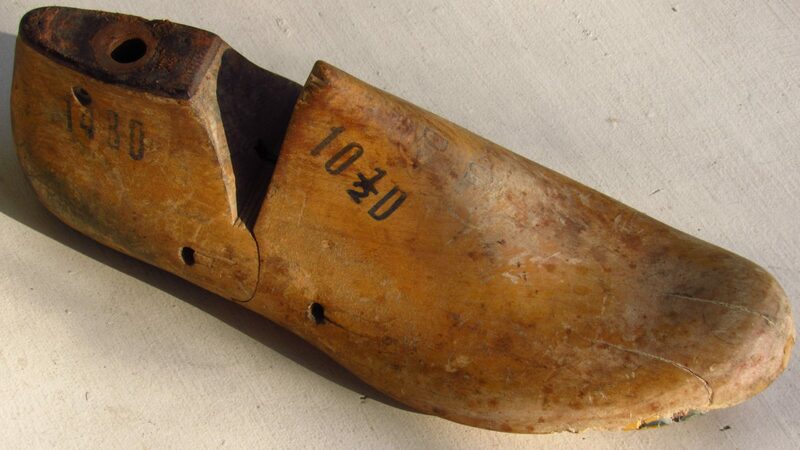 Last – The wooden or plastic form over which a shoe was constructed. The last gives the shoe its distinctive shape. Lining – material that lines the inside of the shoe. 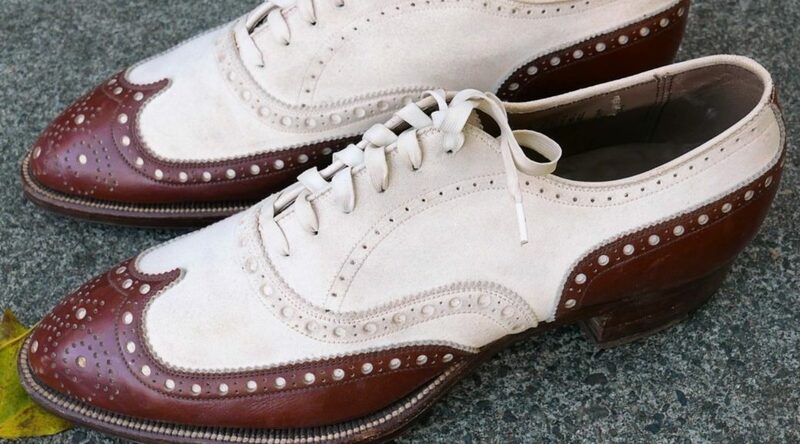 The lining in vintage shoes is usually made of sheepskin or tough cotton drill. 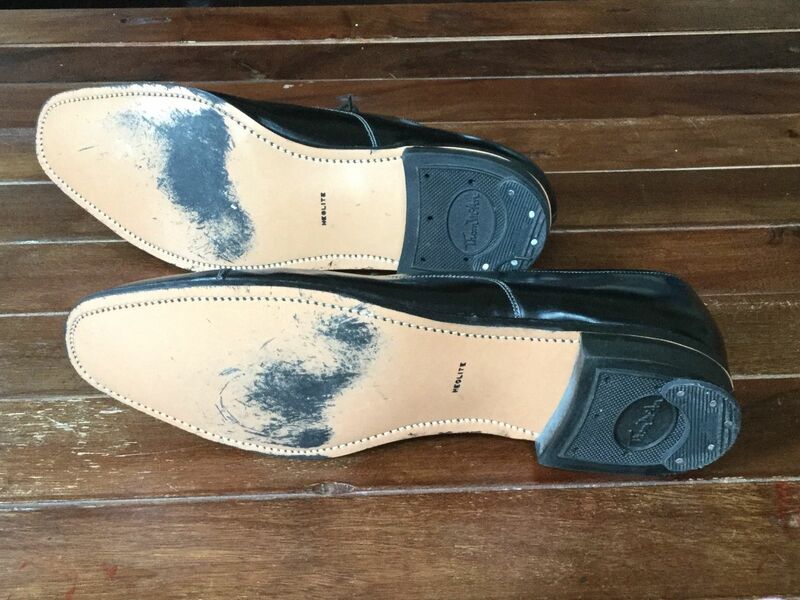 Made in … – The country the shoe was made in. 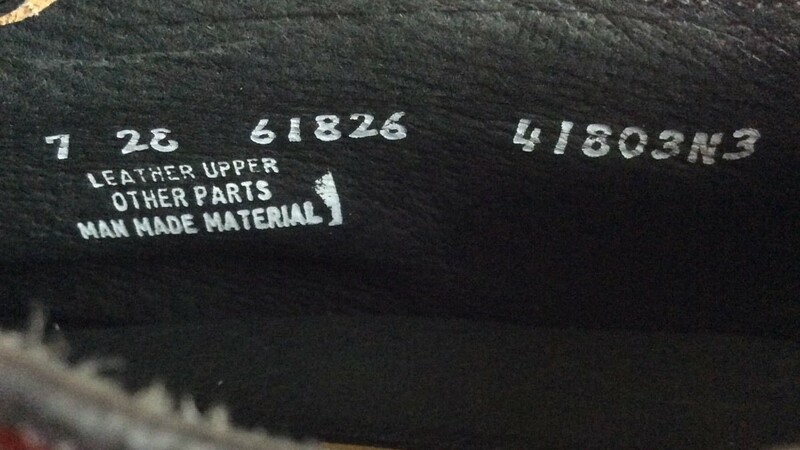 Prior to the 80s, most shoes from US manufacturers were made in the USA. 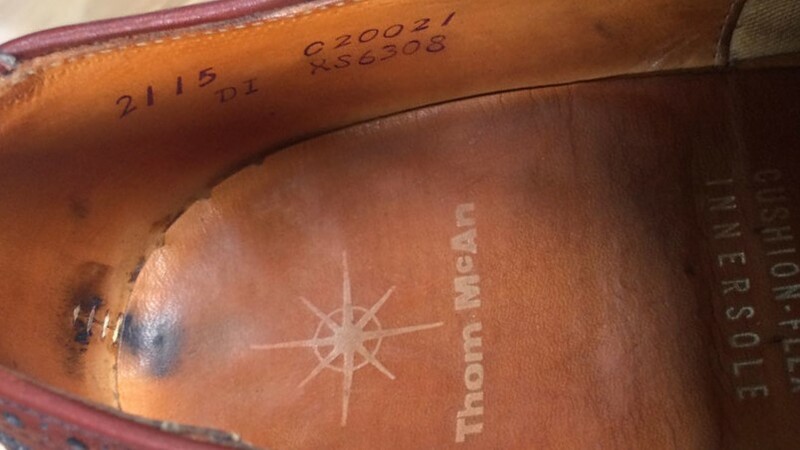 If there is no “Made in” label, its likely the shoes were made in the USA. Poromeric Upper – A synthetic leather upper. Often seen in military shoes or faux reptile leather shoes. See Corfam. 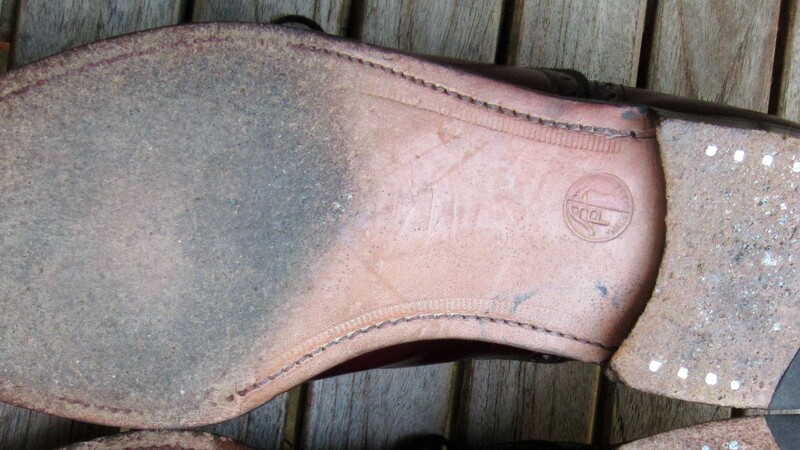 Outsole – the bottom of the shoe that is in direct contact with the ground. 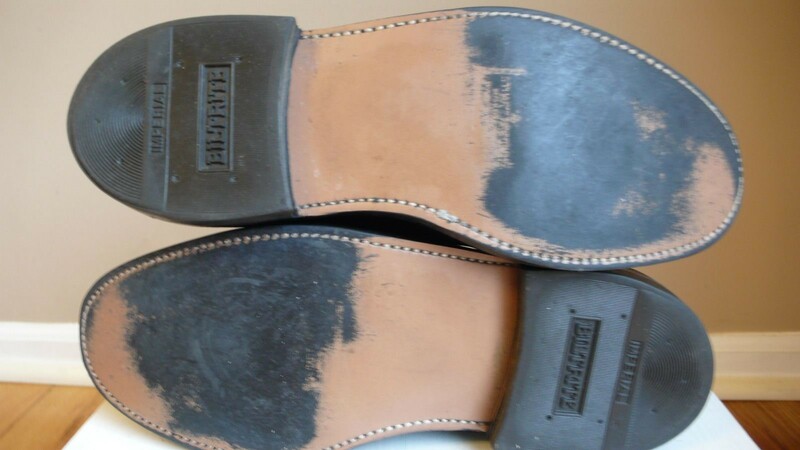 In vintage shoes, the sole is usually leather but can also be made from rubber resin. Shank – A curved piece of steel or fiberglass built into the middle portion of a shoe that provides support. You will never see one but occasionally it is mentioned. 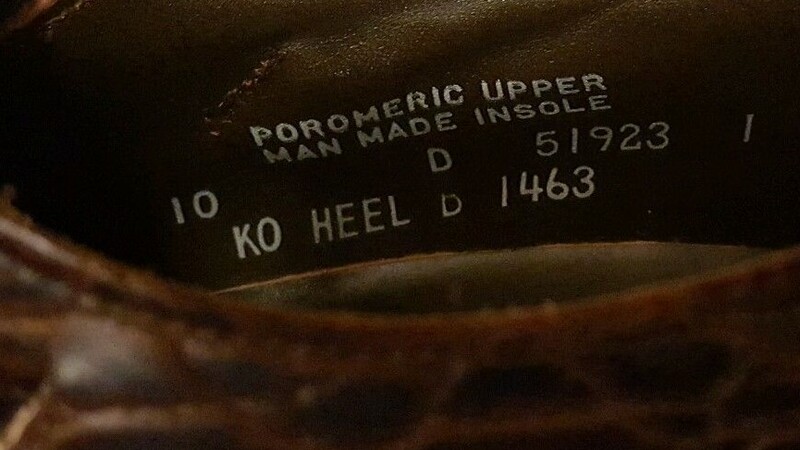 Upper – The visible leather portion of the shoe above the sole. David, thanks for posting all this terminology. One quibble though. I thought that a combination last indicated the heel width was less than the ball width. I don’t believe it has anything to do with the instep. Most manufacturers have changed to making the heels smaller (usually by 2 sizes) than the ball measurement, called a combination last. Perhaps the reason is because a larger portion of the population have narrow heels than previous generations. For example, 11.5 C/A means C width at ball with an A heel. 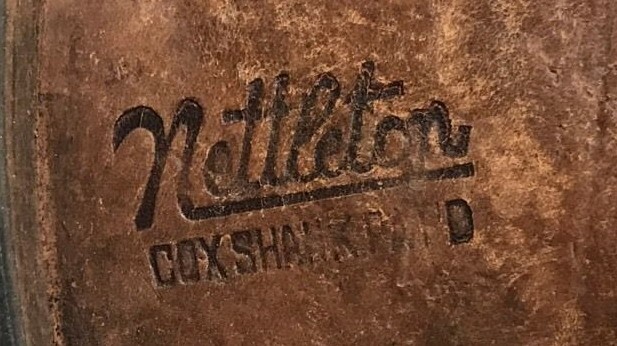 Alden and Nettleton (and possibly others) write the same measurements as 11.5 A/C (heel first). Some old timers, like Russell Moccasin, may state the same as “11.5 A, ball to C”. Thanks. I updated the description. David thank you for your informative site . I enjoy the shoes and your sense of humor .